On September 27, 1792, George Cruikshank was born in London. His father, Isaac, was a leading caricaturist of the 1790′s. Both George and his older brother, Isaac Robert would enter that profession as apprentices and assistants to their father. George Cruikshank would come to be known as a preeminent artist of his time, and as a stern, moral Victorian. That image crumbled, however, following his death. Cruikshank established himself as an overtly political artist early on. He experienced his first success with William Hone’s The Political House that Jack Built, a play on the popular nursery rhyme “This Is the House that Jack Built.” The rhyme had a long history of being adapted for satire and parody. Samuel Taylor Coleridge wrote a self-parody under the name Nehemiah Higginbotham in 1797 using the rhyme as his foundation; in the Rolliad’s “Political Miscellanies,” “This Is the House that George Built” criticizes George Nugent Grenville, Duke of Buckingham, for supporting William Pitt the Younger. By the 1830′s, Cruikshank had reached the height of his career. John Marcone, a short-term editor of The Monthly Magazine, invited Cruikshank to do a series of illustrations for an up and coming author, Charles Dickens. 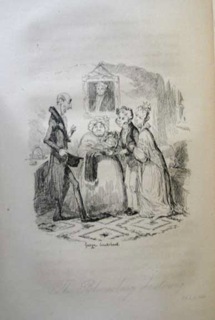 Cruikshank’s first partnership with Dickens was for Sketches by Boz (1836). Three years later, Chapman and Halls issued an enlarged edition, for which Cruikshank enlarged all but one of his original illustrations and completed thirteen more. He also completed the Cheap Edition’s frontispiece, which was eventually immortalized on the cover of Dickens Quarterly. Cruikshank again worked with Dickens when Oliver Twist was published in Bentley’s Miscellany (Feb 1837-Apr 1839). He also illustrated Dickens’ Memoirs of Joseph Grimaldi (1838) and “The Lamplighter’s Story” in The Pic-Nic Papers (1841). By this time, however, Cruikshank’s politics had already begun to complicate his relationship with Dickens. Cruikshank, formerly a heavy drinker, had become a complete teetotaler. Dickens disapproved of the overbearing attitude of Cruikshank’s temperance works like The Bottle, and he also didn’t appreciate Cruikshank’s moralistic emendations to a volume of fairy tales. Following Dickens’ death, Cruikshank audaciously asserted in a letter to The Times (30 Dec 1871) that he’d thought of most of Oliver Twist’s plot. Cruikshank wasn’t the first illustrator to make such a claim; Robert Seymour had made a similar one about The Pickwick Papers–which Dickens vigorously denied in the preface to the 1867 edition. Dickens’ friend and biographer John Forster answered Cruikshank’s claim with evidence from Dickens’ correspondence, though admitted that Cruikshank’s intimacy with London’s underworld had been instrumental. Soon after, however, it became evident that Cruikshank had been something less than the upstanding Victorian everyone had assumed. His dying words, “Oh, what will become of my children?” puzzled his wife; the couple were childless, as had been Cruikshank and his previous wife. Soon it came to light that Cruikshank had had an affair with his maid, Adelaide Attree. When his wife had discovered the pregnancy, Attree refused to identify the father and was removed from the household accordingly. But Cruikshank simply moved her to a home close by, and she took the married name “Archibold.” The two had a total of eleven children together; the youngest was conceived when Cruikshank was 82! While this revelation certainly dimmed his peers’ estimation of Cruikshank’s character, it did little to quell admiration for his work. To this day, Cruikshank remains a celebrated illustrator, with over 10,000 prints, plates, and illustrations to his credit. His works appear in numerous museums, and his works are highly sought after among collectors both of Charles Dickens and of nineteenth-century illustrations. 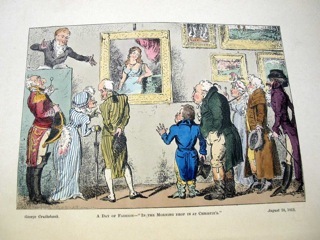 Collectors of Cruikshank rely upon Albert Cohn’s bibliographical catalogue of Cruikshank’s printed work, among other numerous available resources. This entry was posted in 19th-Century Literature, Charles Dickens and tagged 19th century illustration, Charles Dickens, George Cruikshank, temperance on September 27, 2013 by tavistock_books.